Australian Winner online (www.australianwinner.com) is found July 2004, is one of the highest visiting and fast growing websites written in simplified, traditional Chinese and English, contains multiple industries business and cultural information, is one of the fastest growing and biggest websites in southern hemisphere. The visitors are mainly from Australia, China, USA, Canada, Europe, and worldwide Chinese community over 110 countries and territories. We provide services covering multiple areas: Advertising, Business Info, Logistics, Outsourcing, Printing, Trading, etc. Our database archived multi million information of worldwide industries, capable to help you (both buyers & suppliers) to find the products source and target markets, promote your business images, products and projects with minimum costs. 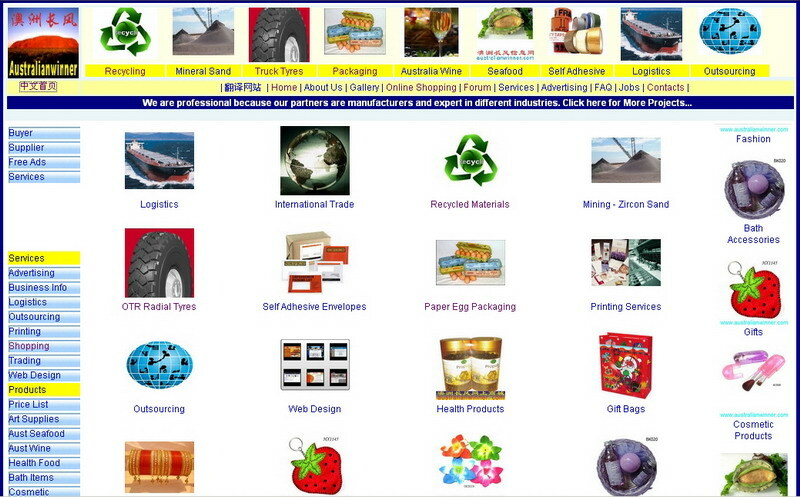 All business information posted online are provided by professional business organisations and manufacturers. 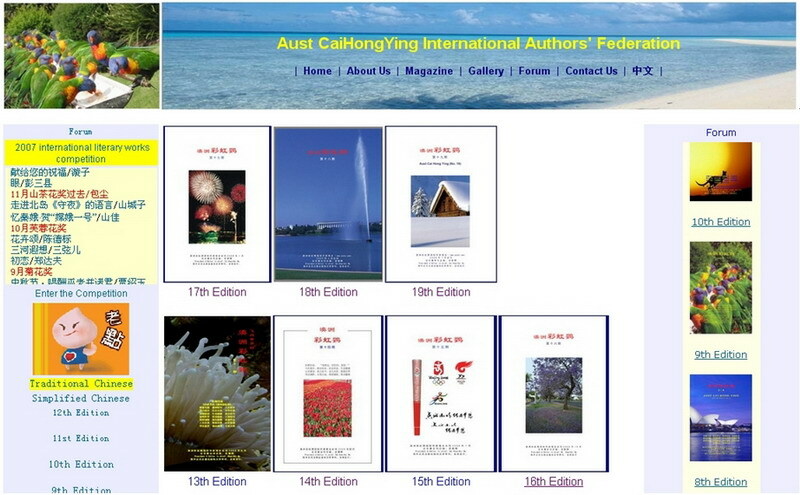 Aust CaiHongYing Authors' Federation: Own the biggest Chinese quarterly literature magazine "Aust CaiHongYing"
Archived by Australian National Library: The National Library of Australia catalogue www.australianwinner.com website and added the record to the National Bibliographic Database (a database of catalogue records shared by over 1,100 Australian libraries), as well as to their own online catalogue. Chinese Module: written in simplified and traditional, contains business information, migration, education, travel, living in Australia, worldwide weather, local traffic and international flight real time tracking, tens of thousands images of Australia, Taiji, away from home stories, our Community, Health and Beauty, Fishing, International Literature Competition, Website Links archive, Sports, Worldwide Chinese Online Publication, etc. English Module: contains business information of multiple industries, such as Worldwide Airports , Apparel , Auction , Beverages , Building , Construction , Development , e-commerce , Education , Engineering , Factories , Fashions , Food , Gift Boxes , Holiday , Hotels , Insurance , Logistics, Machinery , Manufacturer , Motels , Real Estate , Research , Risk Mgnt , Online Store , Packaging , Printing , Property , Shopping , Sports , Suppliers , Technology , Textiles , Tobacco , Tools , Travel , Others (more to be updated) , etc. We have our people on the ground in main areas of interest (South America, India, Middle East, China, Europe, Australia, Thailand and US, etc). 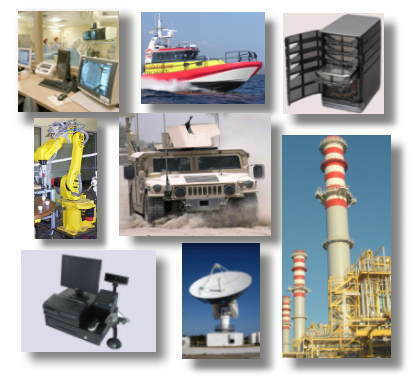 We have established excellent partnerships with the producers, exporters and trading companies mainly in many fields. Through our extensive international network, we convert our comprehensive, independent and detailed market knowledge into value addition to our clients. We operate our own shipping fleets which gives us the opportunity to offer highly competitive prices. We know all of our suppliers personally and always look to interact in positive and constructive ways to solve any potential obstacles our clients might have. We will work with you until we get it just the way you want it. Australian Local conditions and social customs. Migration system and relate information. Education system and relate information. 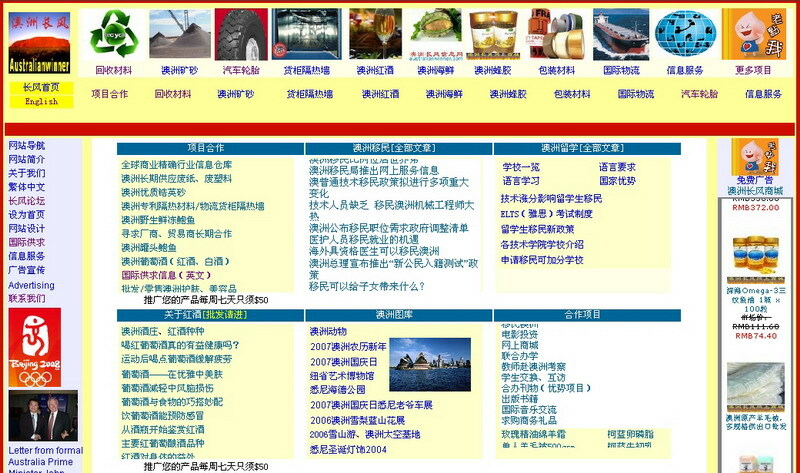 AUST WINNER FORUM is one of the biggest online Chinese communities in Australia New Zealand region. Business opportunities amongst Australia, China and other countries. Australia travel information and thousands of images. Gallery contains thousands images of Australia. Online real time Airlines information. Australia major cities transportation timetable. Links of worldwide online publication. Australian Customs and Quarantine system and relate information. China and other countries travel information. Aust CaiHongYing International Author’s Federation (also known as Aust CaiHongYing Chinese Writers' Federation), established in December, 2004, is the worldwide non-government, non-political nature, non-profit, non-religion, the completely independent folk pure literature organisation. Most of our members are Chinese writers from Australia, China, USA, Canada, etc. The federation has success promoted the name to the worldwide Chinese communities through the website (www.azchy.com) and has success published and distributed 21 edition (till July 2010 of "Aust Cai Hong Ying" quarterly magazine (ISSN 1832-3456). National Museum of Modem Chinese Literature in BeiJing. Some other countries libraries, etc. Reference Letters: Aust Cai Hong Ying International Author's Federation has received many letters/messages from many government leaders, include 2005 & 2006 formal Australia Prime Minister John Howard, 2006 VIC Premier Mr. Steve Bracks, 2006 NSW Premier Mr. Morris Iemma Portrait, 2007 Aug QLD Premier Mr. Peter Beattie, 2007 WA (West Australia) Premier Mr. Alan Carpenter, 2007 Vic Premier Mr. John Brumby, etc. 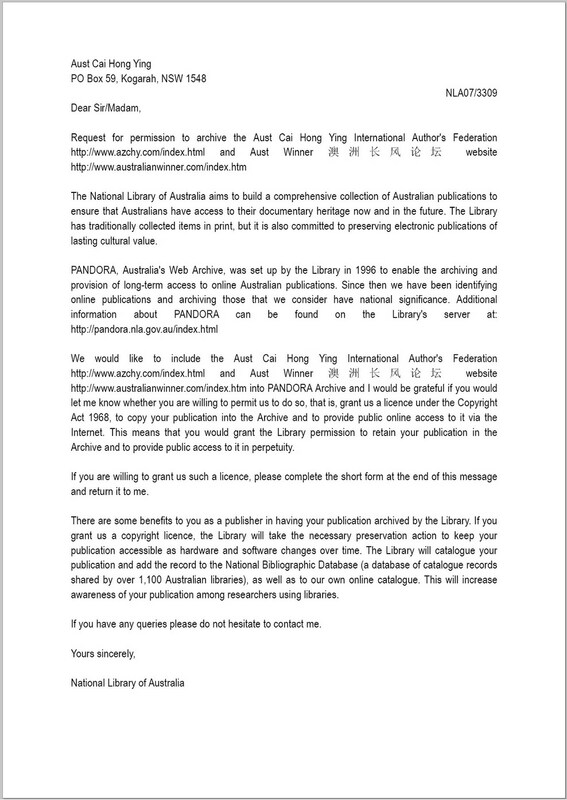 www.australianwinner.com and www.azchy.com have been archived by the PANDORA Archive of National Library of Australia （NLA07/3309). Click here to view the message of the National Library of Australia. The National Library of Australia aims to build a comprehensive collection of Australian publications to ensure that Australians have access to their documentary heritage now and in the future. The Library has traditionally archived items in print, but it is also committed to preserving electronic publications of lasting cultural value. PANDORA, Australia's Web Archive, was set up by the Library in 1996 to enable the archiving and provision of long-term access to online Australian publications. Since then we have been identifying online publications and archiving those that we consider have national significance. The Library will catalogue our publication and add the record to the National Bibliographic Database (a database of catalogue records shared by over 1,100 Australian libraries), as well as to our own online catalogue. This will increase awareness of your publication among researchers using libraries.